Sociologists say people’s willingness to hit the streets has waned considerably, with many voters sceptical both of the Kremlin and the opposition. One year ago, large-scale street protests in Moscow seemed to overturn the indifference toward politics that had dominated the Russian public consciousness for much of the 2000s. Today, sociologists say, people’s willingness to hit the streets has waned considerably, with many voters sceptical both of the Kremlin and the opposition. But the mass demonstrations – which called initially for new parliamentary elections and eventually for an end to the rule of President Vladimir Putin – galvanized a trend of vocal public involvement in local issues nationwide, with some analysts speculating that would-be protesters in the capital could be reinvigorated by municipal elections in the coming two years. 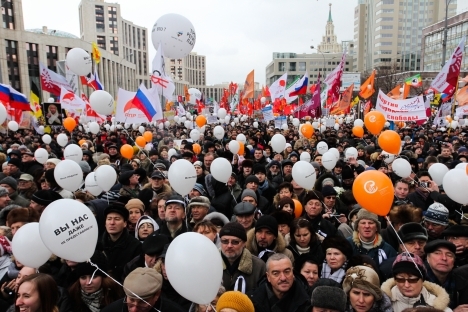 Tens of thousands of Muscovites took to the streets after parliamentary elections on Dec. 4, 2011, insisting ballots were rigged and demanding a revote. Thanks to the rallies, “political protest was legitimised as a means of interacting with the authorities,” said Mikhail Dmitriyev, head of the Centre for Strategic Research, a think-tank that accurately predicted the protests. But, while two-thirds of the population currently considers public protest a valid way of fighting for their rights, only 5 percent are willing to participate in rallies themselves, Dmitriyev said, citing his centre’s research. Back in October of this year, 11 percent of the country’s population was ready to join street protests, same as in June 2009, according to the independent Levada polling agency, which said protest activity peaked at 19 percent last April, shortly after Putin’s election as president. Analysts attribute the dwindling interest in street rallies to a number of factors, including a tough response by authorities and the opposition’s failure to offer viable political alternatives. Another constraint appeared early on: Even when the original wave of protests was strongest in Moscow, its goals and messages found scant visible support in the regions. This division – described as a split between relatively well-off, urban professionals and a more conservative majority in the provinces – has been a key element of both the public’s response to the opposition movement and the Kremlin’s. The authorities, encouraged that protest is not spreading from the capital, refused to cancel the results of the parliamentary vote, in which the Kremlin’s United Russia party clutched a narrow majority in the State Duma. Despite people’s diminishing willingness to demonstrate publicly, a sense of dissatisfaction seems to be growing. The state-run pollster VTsIOM said in November that 51 percent of the population reported seeing political discontent in others and 37 percent admitted experiencing it themselves, a moderate increase from 31 percent in 2010. Throughout the 2000s, street protest was a fringe affair, as rising standards of living kept people distracted from politics, analysts said. In 2004, Putin, widely credited by Russians for the country’s growing wealth, won the presidency with 71 percent of the vote, and in 2008 his protégé, Dmitry Medvedev, now the prime minister, won with 70 percent. But by the election cycle of 2011-2012, a slowing economy coupled with ubiquitous corruption made the emergent middle class question the Kremlin’s control of the political scene, said Stanislav Belkovsky, a spin doctor-turned-oppositional pundit who heads the Institute of National Strategy. Putin won with 63 percent in March, with no serious challengers from the opposition. A Levada poll that month said that 24 percent of voters did not approve of any of the presidential candidates on offer. Nonetheless, the ruling United Russia reaffirmed its position in the regions by carrying most votes during a round of local elections on Oct. 14. The party is winning back a portion of middle-class voters thanks to an ongoing revamp –striving for more transparency and intra-party competition – coupled with the opposition’s lack of a constructive agenda, said Vladimir Burmatov, a Duma deputy with United Russia. And even opposition activists admit that political protest is flagging. “The public is disappointed” because protests were numerous while producing few tangible results, said Isabel Magkoeva, a leftist activist and co-organizer of Occupy Moscow protests in May. At the same time, activism is budding slowly even among the so-called silent majority that ignored all forms of public action throughout the 2000s, experts said. “It’s not like they became freedom fighters, but they stand up for their rights now,” said Maxim Vedenyov of Tigr, a civil rights group from the far eastern Primorye Region. Examples include campaigning against illegal construction in existing neighborhoods or questioning undue hikes of utilities payments, Vedenyov said. He was echoed by Olga Kryshtanovskaya, a former member of United Russia and a prominent expert with the Sociology Institute of the Russian Academy of Sciences, who has studied the recent protests. There are no general statistics for Russian grassroots activism, but one figure gives an inkling of the heightened public interest in politics: Some 690,000 people volunteered to work as election monitors during the presidential polls in March, according to Forbes Russia; during the previous vote in 2008, parties were unable to muster 95,000, the Communist Party said at the time. For now, activism seems mostly confined to local affairs, but most experts and politicians interviewed by RIA Novosti agreed that dissent is mounting and the right trigger could expand it much more broadly. “The public is lying low. They got excited during the elections … but then it all quieted down because there is no more immediate reason for protests,” agreed Irina Khakamada, a former liberal politician who left self-imposed retirement in November to sit on the Kremlin’s human rights council, an advisory body with a track record of gainsaying presidents. “But everyone’s complaining in their kitchens, unlike in the 2000s. Russia’s in a pre-crisis state,” Khakamada said. A new confrontation may flare up as early as 2013 or 2014, when the opposition-minded Moscow Region is to elect a new governor and the capital will choose a new city legislature, respectively, said Dmitriyev of the Centre for Strategic Research.